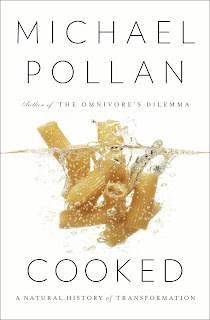 In Cooked Michael Pollan writes about his efforts to learn to bake delicious, crusty, naturally-leavened bread, as well as about barbecuing and braising meat, fermenting vegetables, and about cooking in general. He discusses the history of white bread in America, and mentions that Wonder Bread and its competitors dominated the diet of Americans in the 1950s, as well as this interesting observation about 1960's "hippie texture" bread, which I remember with no pleasure at all. In our family, Wonder Bread was the children’s bread. My sister, brother, and I, as we grew up in the fifties, ate Wonder Bread toasted for breakfast, and our bag lunches always contained sandwiches: peanut butter, tuna, sliced meat, yellow cheese or maybe cream cheese with walnuts on Wonder Bread. At dinner we ate bread too – my parents felt that bread was an essential part of every meal. I sometimes ate the slightly rubbery brownish Wonder crusts first and then squeezed and rolled the soft white center into a solid ball, which had an interesting texture in my mouth. Even the wrappers of Wonder Bread, which constantly boasted of higher numbers of ways it “built strong bodies,” were for children. When I was in kindergarten or first grade, my friend Judy took one of the brightly colored Wonder Bread wax-paper wrappings to the playground at school and slid down the sliding board with it under her bottom. The wax made the slide really slippery – surprising the other kids when they slid down. Or maybe she just told me she wanted to do this, and didn’t really do it. I don’t know. 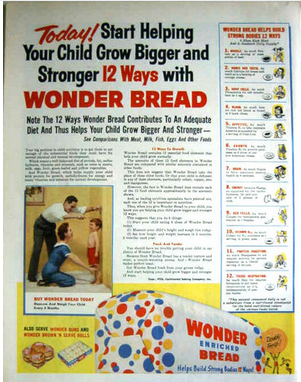 For our parents, Wonder Bread was at best unappealing, and I seriously doubt that they believed all its claims to foster growth in their children. Once or twice a week my father went to a Jewish bakery called Pratzel’s, which was a few blocks from our home in University City, MO. He always bought rye bread, which was what he liked to eat. He had several slices of rye bread with breakfast and dinner. I have no memory at all of what he ate for lunch most days, though corned beef on rye with a half-sour pickle might have been his Saturday choice. This bakery rye was the closest to the bread of his childhood when rye bread was the main food, or even the only food, for almost all meals. Even for Passover, my radical father bought several loaves and kept them in the freezer so he wouldn’t have to resort to Wonder Bread, or for that matter, to matzoh. Pratzel's made a number of other baked goods, which we ate as occasional treats: pumpernickel, a white bread called “buttercrust,” jelly donuts, bagels, kaiser rolls with a crisp crust, challah, cylindrical cinnamon bread made from a challah-like dough, cheese or jelly-filled Danish, and coffee cake or stollen. But rye bread was most important among all these choices. My father didn’t just prefer Pratzel’s bread to grocery-store bread. He vastly preferred their baked goods to those from other Jewish bakeries. Each loaf of Pratzel’s rye bread had a Union Label on the heel of the bread, which I remember in a sort of schematic way; it was red and blue. It wouldn’t surprise me if some kind of union politics, not only taste, played a role in my father’s bakery preference. He had a lot of politics in his background. As we grew a little older, our taste in bread moved much closer to our parents’ taste, and we began eating the same bread that they did. 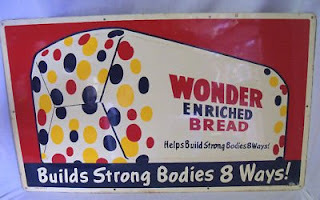 I think by the time we were teenagers, the flamboyant red, blue, and yellow bubbles on the Wonder Bread package no longer appeared in the white metal flower-decorated Bread Box in my mother’s pantry. Just the white paper bags – or later plastic bags – containing real Jewish rye and other real bread. As a result, I didn't experience the sixties bread folly in anything like the same way that a lot of people did! 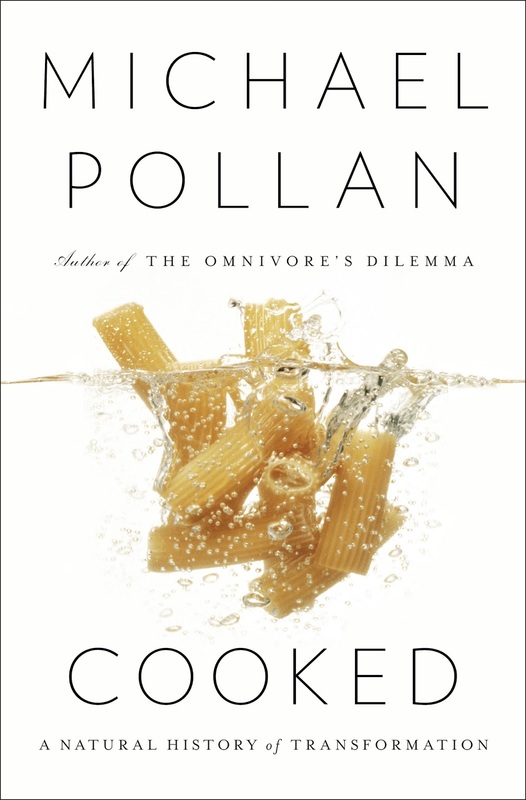 In Pollan's long and very readable narrative about bread in Cooked, he visited a Wonder Bread factory and several small-scale artisan bakeries, but he never visited any old-style ethnic bakeries like Pratzel's, though it would have been possible for him to do so. As it happens, Pratzel's Bakery remained in business until the fall of 2012, closing after almost 100 years of baking. Wonder Bread, a brand founded in 1921, was owned by several baking companies in its long history. 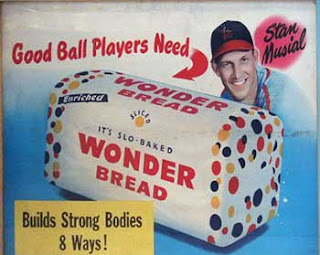 When the Hostess corporation went out of business, coincidentally also in the fall of 2012, Wonder Bread was one of the brands that disappeared from supermarket and convenience store shelves -- but it came back around a year later.